What is believed to be a wedding party posing on the bridge. Thought to be the Wood Family. 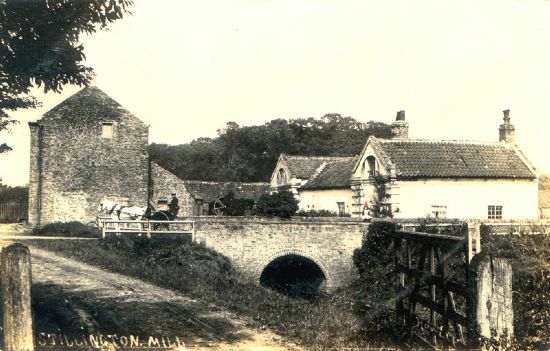 The Dutch style millhouse, dating from the early 17th Century, can be seen in this postcard. This was built by the Croft family, the architect being a friend of theirs. The flywheel of a stationary engine can be seen on the left of this image. When water levels were low the engine would have been used to power the mill. Note the sluice gate. This one was used to return water from the dam to the River Foss, regulating the water level in the dam. 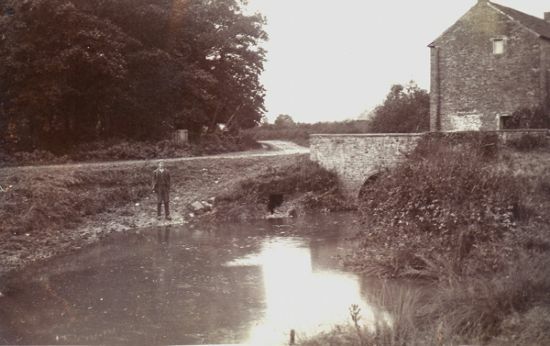 and the mill bridge. 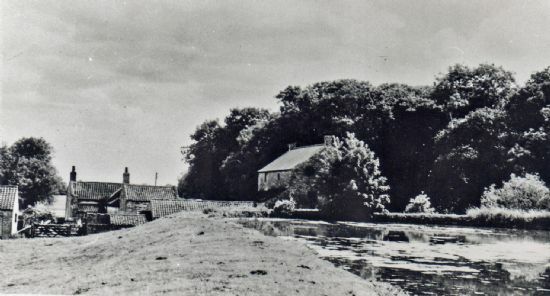 Note the gated Skeugh lane. but taken approximately 70 years later. 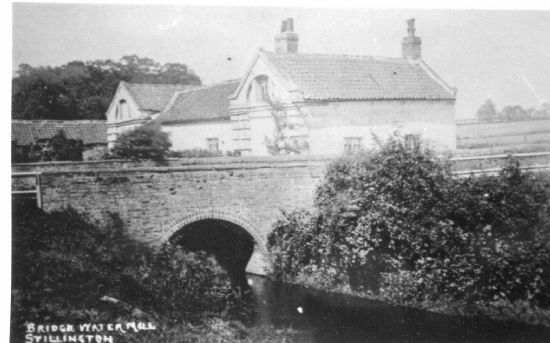 At the rear of the Mill was a substantial garden and looking at this image the Miller also had a good supply of eggs. 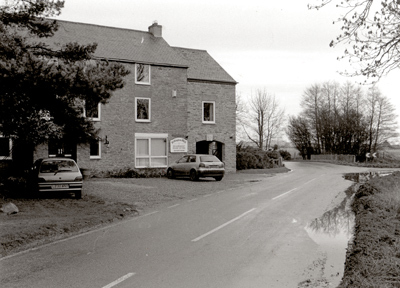 Please view the next image taken in 1999 from a similar position. to the previous one, but some 90 years later. Note no Home Farm in the Background. Home Farm was built around 1910. Please view the next image. 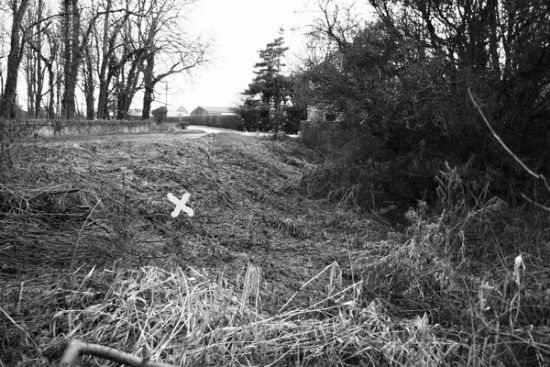 This up to date image of the previous one shows Home Farm clearly visible in the background, the X marks the position where the person is stood and was taken some 109 years later. Note how the Mill outflow has silted up. 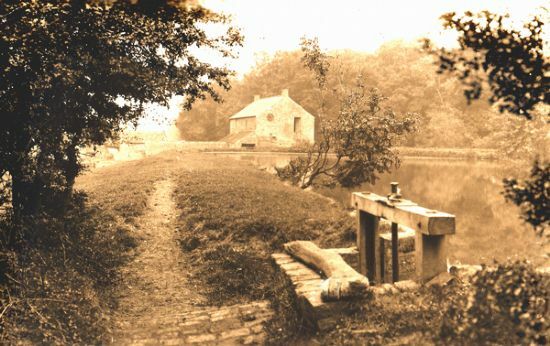 If you click on the image to enlarge it and see two people, who are just visible in this image sat on a fence in the garden to the rear of the Mill, just to the right of these two a small girl dressed in white can be seen. 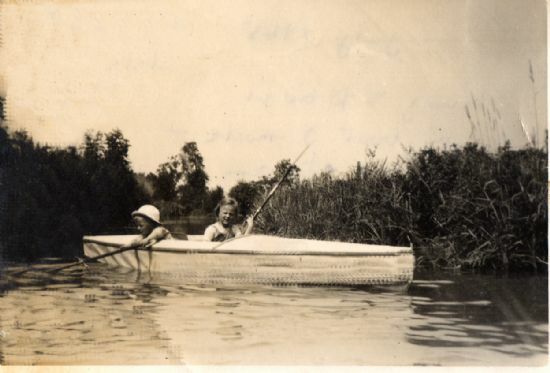 Mary and David Green paddling a collapsible canoe along the leat that fed the mill dam. Note the sizeable water course. Mid 20th Century aerial view. 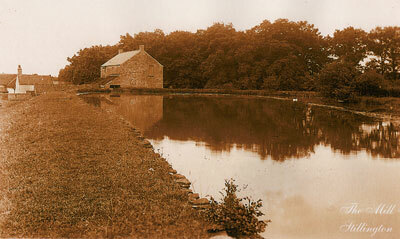 A fantastic photograph showing the mill with its elegant 17th Century Dutch style house behind. (Sadly this was later demolished). The mill is still in production and the house occupied - there's a wisp of smoke coming from the chimney and there's a tidy vegetable plot at the rear of the house. A family snap. 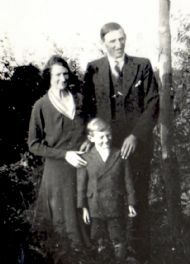 Arthur and Dora Shepherd with their son Geoff, who was to be the last miller at Stillington Mill. Dora was the daughter of Tom and Annie Gibson who between them ran the mill for over thirty years. Is Stillington the noisiest village? 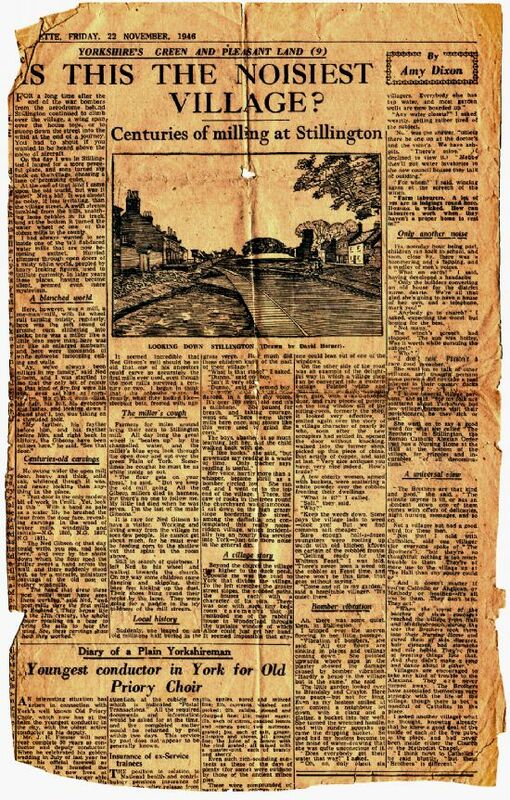 This article, probably from The Yorkshire Gazette, tries to determine this by touring the village interviewing, among others, the miller Ned Gibson. See the page 'Noisiest Village' to read the full text. 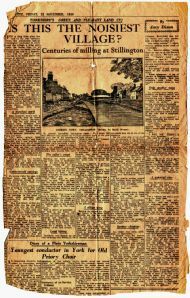 From The Yorkshire Press on the closure of Stillington Mill.